Let&apos;s just put attributes to one side for a moment and look at transformer parameters. Transformer parameters are often set in a fixed way (hard-coded) or set to take on the value of a particular attribute. However, in the same way that attributes can be constructed, text or arithmetic editors can be used to build values for transformer parameters. This is very useful because it allows the parameters (for example label size) to get a different value for each feature. An attribute could be read from a source dataset, or calculated using an ExpressionEvaluator, so that one feature creates a label 10 units in height, another creates a label 15 units high, and so on. It is no longer a fixed value. 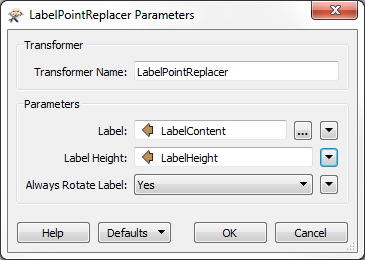 If a parameter value needs to be calculated or constructed, instead of using a separate transformer, FME has integrated string and numeric editors built into parameter dialogs. It&apos;s a fixed rule that the editor dialogs available depend upon the type of parameter being set. 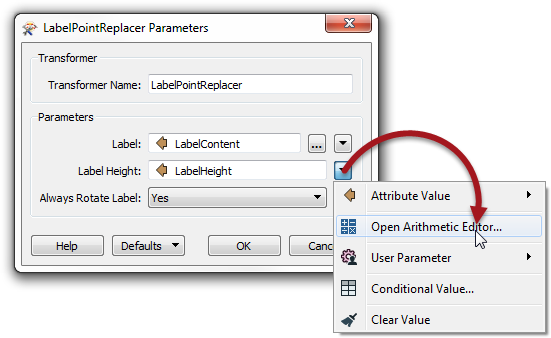 For instance, the Label parameter in a LabelPointReplacer opens in a text editor because the parameter requires a text value. 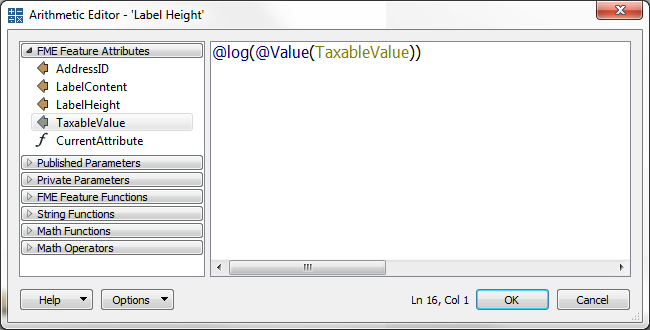 The Label Height parameter opens in an arithmetic editor because that parameter requires a numeric value. Like when attribute values are constructed, workspaces are more compact when as many peripheral operations as possible are directly integrated into a single transformer or parameter. However, as with attributes, it&apos;s important to use Best Practice and ensure it has proper annotation, else it&apos;s difficult for a casual observer to understand what the workspace is meant to do. Another drawback, specific to parameters, is that you don&apos;t also get the information as an attribute to use elsewhere. For example, if you construct a label string in the LabelPointReplacer, that string isn&apos;t available as an attribute elsewhere in the workspace.